On the 26th (Sun), delve into the distant past at Pukara de Quitor, take in the natural beauty of Geyser del Tatio, browse the eclectic array of goods at Feria Artesanal San Pedro de Atacama, then see the interesting displays at Father Le Paige Museum, and finally boost your wellbeing at Atacama Desert. To find ratings, reviews, more things to do, and other tourist information, go to the San Pedro de Atacama road trip site . Sao Paulo, Brazil to San Pedro de Atacama is an approximately 12.5-hour combination of bus, flight, and shuttle. You can also do a combination of bus and flight; or drive. Traveling from Sao Paulo to San Pedro de Atacama, you'll gain 1 hour due to the time zone difference. 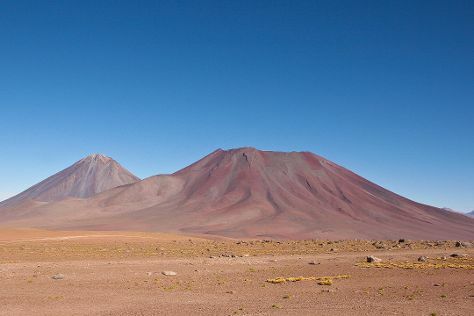 Traveling from Sao Paulo in May, plan for colder nights in San Pedro de Atacama, with lows around 2°C. Wrap up your sightseeing on the 26th (Sun) to allow time to travel to Castro. Main city on Chile's Chiloe Island, Castro represents one of the country's oldest inhabited settlements, making its fortune as both a tourist center and transportation hub. Start off your visit on the 27th (Mon): look for gifts at Aylla Chiloe, then contemplate in the serene atmosphere at Iglesia San Francisco, then capture your vacation like a pro with an inspiring photography tour, and finally hunt for treasures at Feria Artesanal Dalcahue. For ratings, photos, traveler tips, and other tourist information, refer to the Castro route website . You can do a combination of shuttle, flight, and bus from San Pedro de Atacama to Castro in 11.5 hours. Alternatively, you can take a bus; or take a bus. Traveling from San Pedro de Atacama in May, expect nights in Castro to be a bit warmer, around 6°C, while days are a bit cooler, around 14°C. Finish your sightseeing early on the 27th (Mon) so you can drive to Ancud. A city of 40,000 people, Ancud was the capital of Chiloe Archipelago until it was superseded by the city of Castro in 1982. On the 28th (Tue), enjoy the sea views from Faro Corona en Chiloe, enjoy the sand and surf at Playa Lechagua, stop by Mercado Municipal de Ancud, then examine the collection at Museo Regional de Ancud, and finally examine the collection at Museo Bomberil Cuerpo de Bomberos de Ancud. To find photos, maps, and tourist information, go to the Ancud trip maker . You can drive from Castro to Ancud in 1.5 hours. Another option is to take a bus. Expect a daytime high around 14°C in May, and nighttime lows around 6°C. Cap off your sightseeing on the 28th (Tue) early enough to travel to Hanga Roa. Start off your visit on the 29th (Wed): don't miss a visit to Rano Raraku, explore the ancient world of Ahu Tongariki, then delve into the distant past at Ahu Nau Nau, and finally enjoy the sand and surf at Anakena Beach. 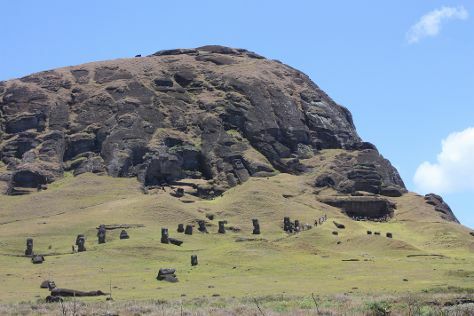 Keep things going the next day: explore the wealth of natural beauty at Rapa Nui National Park. To see more things to do, other places to visit, photos, and other tourist information, use the Hanga Roa trip itinerary maker website . Getting from Ancud to Hanga Roa by combination of bus and flight takes about 10.5 hours. The time zone difference moving from Chile Time (CLT) to Easter Is. Time (EAST) is minus 2 hours. Expect somewhat warmer temperatures when traveling from Ancud in May; daily highs in Hanga Roa reach 27°C and lows reach 19°C. Cap off your sightseeing on the 30th (Thu) early enough to travel to Santa Cruz. On the 31st (Fri), see the interesting displays at Colchagua Museum, then learn about winemaking at Clos Apalta Lapostolle, and then do a tasting at Viu Manent Winery. To see photos, reviews, more things to do, and other tourist information, refer to the Santa Cruz tour itinerary planner. Traveling by combination of flight, train, and bus from Hanga Roa to Santa Cruz takes 11.5 hours. Due to the time zone difference, you'll lose 2 hours traveling from Hanga Roa to Santa Cruz. In May, Santa Cruz is a bit cooler than Hanga Roa - with highs of 19°C and lows of 7°C. Finish your sightseeing early on the 31st (Fri) so you can drive to Santiago. Give yourself a bit of retail therapy at Central Market (Mercado Central) and Patricia Ready Galeria de Arte. Let the collections at La Chascona and Museo Chileno de Arte Precolombino capture your imagination. Go for a jaunt from Santiago to Pirque to see Concha y Toro about 38 minutes away. There's still lots to do: take some stellar pictures from San Cristóbal Hill, wander the streets of Barrio Bellavista, explore the world behind art at Museo de Artes Visuales, and take in the exciting artwork at Plop! Galeria. For reviews, photos, and more tourist information, refer to the Santiago route planning app . Getting from Santa Cruz to Santiago by car takes about 2 hours. Other options: do a combination of bus and train; or take a bus. Finish your sightseeing early on the 4th (Tue) so you can travel back home.